…and I’ve very nearly finished the blueberry waffle socks. My mum tried the first one on, and it was a little bit short, so I am making the second one longer, and will need to lengthen the first. I’ve also picked up the lace weight version of Carmen’s shawl. 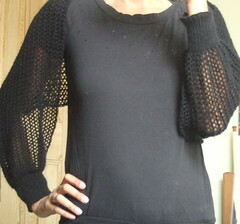 I wasn’t sure whether or not I liked it in lace weight, and I was about to frog it, but changed my mind. I’m quite interested to see what the finished product will look like. Congratulations, the shrug looks lovely and very versatile. Sounds like you’re back into a creative cycle! Congrats! Pretty shawl! That is so luxurious in the lace-weight. Also, your shrug turned out great! The color is perfect and I like the weight of it. I have been a fan of your blog for a while now!! You do such nice work. You have been tagged, read my blog.